Helping researchers to make use of the open science changes and getting involved in shaping the future of new open science systems and tools is the goal of Generation R. Its editor, Simon Worthington, gives some insights into the new platform’s themes and services. Generation R (R = Researcher) is a new editorial platform based on themes, blogposts and learning resources. We asked its editor, Simon Worthington, to answer our questions concerning its scope and organization. Digital transformation is affecting academia on so many levels and so quickly that there is a need to find ways to help scientists and scholars to cope with the pace of change. Generation R’s role is to help people make use of these open science changes, and to facilitate scientists getting involved in shaping the future of these new open science systems and tools. Generation R is an advocate of all things open science: OER, open access, open data, free and open source, etc. We want to see open science ways of working being adopted more speedily and to be spread as wide as possible. Our approach to enable these goals is to take a ‘needs based approach’ to researchers and help them use digital ways of working to do better science. What does Generation R offer? The aim of the editorial architecture of Generation R is to help the academic community to quickly get a view onto a variety of areas of open science practice and then be able to incorporate the ideas or practical tools into their practice. The editorial architecture has a three-step editorial process – collaboratively developed themes, blogposts, and learning resources. The editorial process works in this order: firstly, announce themes in advance and invite the community to collaborate on highlighting key issues; secondly, invite blogposts contributions to develop these key ideas; and thirdly, to work with external partners to develop and disseminate learning resources. What is your aim and who is the target audience of Generation R? The key goal of Generation R is that researchers become open scientists and get involved in shaping science systems. We look to be relevant to the open science activist and to the researcher busy in their work. Our approach to dealing with these audiences at polar opposites of interests in open science is to look at ‘how to do better science and scholarship’ as this can appeal to everyone. What is special about Generation R? Generation R runs themes to address key issues that we have selected because they are new emergent developments in open science system that can be put to use by the wider community. The example initial themes are software citation, the decentralized web, and citizen science. In covering these emergent open science areas we are dealing with moving targets, but also with research communities where open-working and collaboration are the norm. It is these two qualities of open science that have informed our three-step editorial process—collaboratively developed themes, blogposts, and learning resources. The result being that from our editorial process we are able to make new findings and recommendations, and pass these onto the research community. What are the key topics of the blog? Generation R focuses on topics related to open science that are on the close horizon of scientists and scholars, with the idea of helping them navigate and make use of new ideas and the plethora of tools and platforms on offer. As an example our inaugural theme is ‘software citation for research software’. It might seem surprising that until very recently software has never been collected and catalogued for different scientific fields. This includes not recording of the use of software in literature from experiments or research, and neither for developing the conventions for citation standardization. 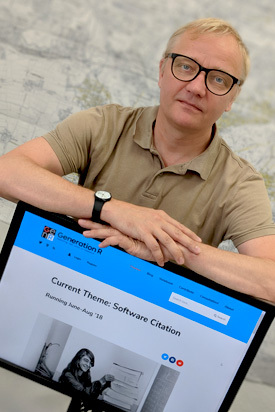 Recently working groups, such as in FORCE11, have looked to rectify this problem and make it possible to catalogue software and create ways for researchers to cite software. The benefits to scientific research and to software development from increased citation will be significant and improve research practice overall. Generation R’s role has been to point to the headline issues and to provide concrete ways to do software citation. Who contributes to Generation R? The contributors are researchers from a wide array of disciplines, and these researchers are varied in their involvement in open science, either as being deeply involved in open science research or as scientists new to the field. Generation R looks to involve researchers and gain contributors from across Europe. Additionally Generation R looks to address issues of equality and ensure that there is gender parity in its contributors, to develop strategies to ensure contributions from those who experience discrimination, and incorporate voices on the periphery. Who is behind Generation R and how is it organized? Generation R is from the Leibniz Research Alliance Science 2.0, an alliance of independent (research) organizations of the Leibniz Association and further external partners. The platform is coordinated from the ZBW – Leibniz Information Centre for Economics and the German National Library of Science and Technology (TIB), both member organizations of the alliance. The editorial office is managed by me, based at TIB and there is an advisory board of academics from across Europe. The platform looks to create partnerships with other research organizations with specializations in themes covered in Generation R to work on learning resources. As an example the first partnership is with the Open Science MMOC on the topic of software citation. This is also a way to bring in community involvement and contributions in the generation of these learning materials. As a last note it is worth saying that the editorial organization is treated as an evolving process. The reason for taking an incremental approach is to address community building and evaluate what types of publishing tools can be best combined to encourage different types of contributions on top of blogposts, which might include: MOOCs, literature listings, working groups, and recommendations, and so on. Simon Worthington is the editor of Generation R. He is based at the TIB – German National Library of Science and Technology. Simon is a publishing technologist and self-styled “book liberationist” as author of “A Book Liberation Manifesto”.